After spending the night up in the air flying from Vegas, we arrived in Chicago VERY early in the morning and made our way to our hostel (trying and failing to stay awake during the journey), hoping that we could just crawl into bed and pass out once we got there. However, we soon found out that we couldn’t even check in until 3pm, so spent a very torturous 6 hours waiting in the lobby, chilling outside and just forcing our eyes to stay open. As soon as we finally managed to get into our room, we absolutely crashed out for the entire afternoon and night. Best. Sleep. Ever. The next day I woke up feeling absolutely horrendous. My cold from Vegas had really taken hold and all I wanted to do was curl up in bed and feel sorry for myself. 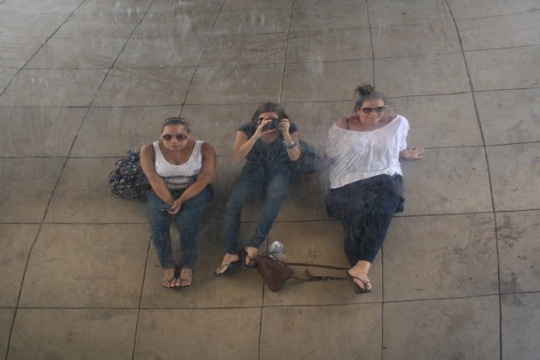 But seeing as we only had a few days in the city, I forced myself to get out of bed and off we went to Millenium Park to see the famous Cloud Gate (aka the big reflective bean shaped sculpture). 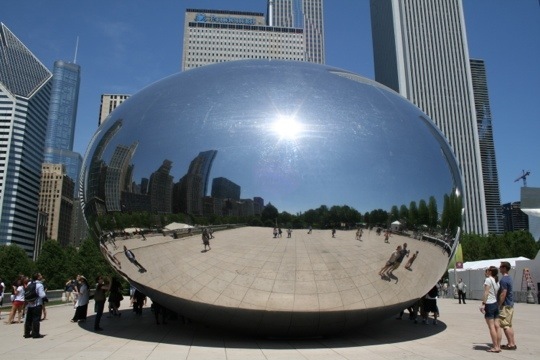 Anish Kapoor’s enormous piece of art is an impressive feat, crowded with tourists all vying to take a picture of themselves lying down in the bean’s reflective surface. So of course, we joined them and then, after taking our obligatory pictures, sat down in the park for a bit of a picnic lunch. That night we had a horrific sleep due to our drunk, immature and disrespectful dorm mates who kept coming in and out, slamming doors, bringing people into the dorm and running up and down the corridor screaming and shouting. Thanks guys…you’re rivaling your Sydney counterparts for the worst room mates ever award! 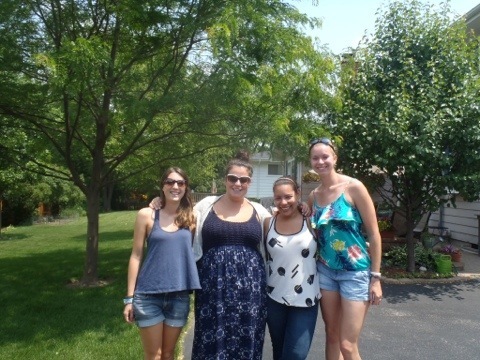 So the next day, we escaped the confines of the hostel and went away for the night to see our friend Kristen (from camp) who lives in a town called Naperville, just half an hour’s train ride from Chicago. It was so awesome to see her, and we actually just sat in her back garden chatting for about 8 hours before it was time for a beautiful, uninterrupted sleep. After being responsible for myself for so long, it was so nice to be looked after and spend some time with a family (a family who cooked us pancakes and bacon for breakfast…thank you mummy Reschke!). Our last day with Kristen was spent just wandering around her hometown and chatting, getting excited for all things camp. Then it was back to city. 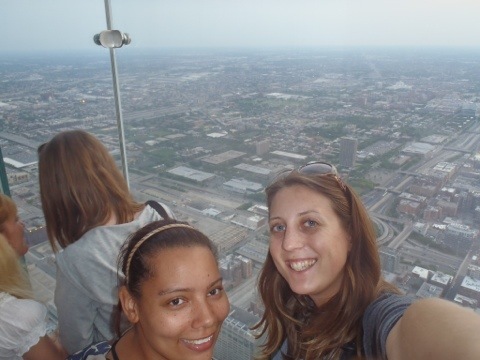 Once we got back to Chicago, Tash and I decided to go up the Sears (now called Wilis) Tower and stand in the Skydeck, a big class box that sticks out the side of the tower so you are basically standing in the air 1,353 feet up…scary, but totally worth it as the views were absolutely incredible! Then it was back to the hostel to pick up our stuff before a very long and delirious night spent at the airport, waiting for our flight to NYC, the last stop on our round the world trip before we make our way to camp for the summer!